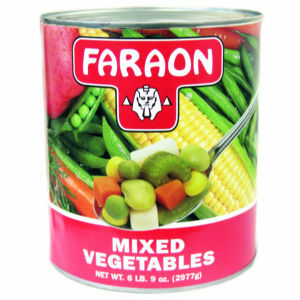 Faraon mixed vegetables in the large size can is a chef's delight. Whether you have a fine food establishment or have a large party, Faraon mixed vegetables is your best choice for combining with Mexican rice, or for hearty salads. Packed with carrots, potatoes, celery, green beans, corn, peas, and baby lima beans. Enjoy!